Vanessa Koman is an actress I've known since she was born, and her film career begins with a classic story. Mondo Cult publisher and writer, Brad Linaweaver, is a long-time friend of filmmaker, Fred Olen Ray, going back to their Florida days in the 70's. 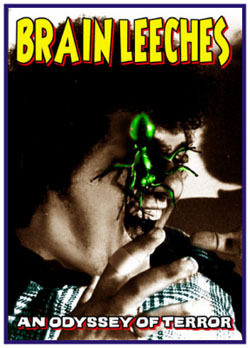 In fact, Fred's first feature film was from a Brad Linaweaver screen story, 1978's cult classic, The Brain Leeches. Brad also appears as an actor in the role of Billy Johnson in that film, and -- as an homage -- director Joe Dante placed the title on a Florida theater marquee in his 1993 comedy set in Florida, Matinee, starring John Goodman. Fred often let Brad cast friends as extras in his films, and in 1994 nine-year-old Vanessa Koman was in that circle of friends Brad brought to be extras in Attack of the 60 Foot Centerfolds. Brad also has a speaking part as "Running Man" in this movie. Now we get to that classic Lana-Turner-sitting-at-the-drug-store-fountain where Vanessa Koman is "discovered." Brad was co-editor with Fred on the book, Fred Olen Ray's Weird Menace, and, after filming on Attack of the 60 Foot Centerfolds, Fred and Brad made a joint appearance at Richard Kyle Books in Long Beach for the book's launch party. After the official launch, I was part of a dinner at a Long Beach Italian restaurant where nine-year-old Vanessa Koman was seated next to Fred, who was seated next to Attack of the 60 Foot Centerfolds' star, J.J. North, who was seated next to Brad. This is way more detail than you need but this is just too much of a "meet cute" for me to pass up on such juicy gossip. The rest of this meet-cute, relying on a homonym, works best when told aloud. Fred passed a wicker basket to Vanessa and asked her, "Would you like a roll?" Vanessa answered, "Yes, in your next picture." Fred froze, bread basket in hand. The entire table erupted in laughter. Soon after Brad Linaweaver became Vanessa Koman's manager. Soon after Vanessa Koman got her first speaking "roll" as a street urchin in Fred Olen Ray's Cyber-Zone. Vanessa Koman is credited on IMDb in three more Fred Olen Ray movies, as an orphan girl opposite ET: The Extraterrestrial's Dee Wallace in 1996's Invisible Mom; as a young tourist in 1998's Billy Frankenstein; then as the star of 1998's Kidwitch AKA Little Miss Magic -- Fred Olen Ray's most successful family film, played widely on HBO and in overseas markets, and the movie that got Vanessa her first listing in TV Guide. Other Fred Olen Ray movies that Vanessa Koman appeared in were Mom, Can I Keep Her? (1998); The Kid with X-ray Eyes (1999); and Bikini Airways (2003). My mom, Betty Schulman, and I can also be seen on screen, as extras in this work of high art. IMDb lists Vanessa's two most recent film appearances in Edward L. Plumb pictures: as "Zombie Dudette" in 2003's Boogie With the Undead and as a party girl in 2008's Her Morbid Desires -- an adaptation of Brad's short story published in his 1999 collection, Clownface (Pulpless.Com). There easily could have been one more film listed in Vanessa Koman's filmography. In 2006 Vanessa was the first actress I offered the role of "Sinead" in my film, Lady Magdalene's. Brad told me regretfully that Vanessa's prior commitments to appear in community theater productions made her unavailable on our shooting dates. So instead the role went to the winner of Miss Teen All American -- a title also held by Halle Berry -- Hope McBane. Brad was Vanessa Koman's manager from the beginning of her film career through her final Ed Plumb credit, and was also responsible for her starring in a short art film by Bretigne Shaffer, The Girl and the Sea (New York Film Academy, 2001). My daughter, Soleil O'Neal-Schulman, then ten, also appears in this short film, and I'll never forget the cold day at a beach near Santa Barbara where my daughter put a wet suit on under a summer dress for a drowning scene in the breaking waves. Brad tells me that he regretted having to end his business relationship with Vanessa but cherishes those years. 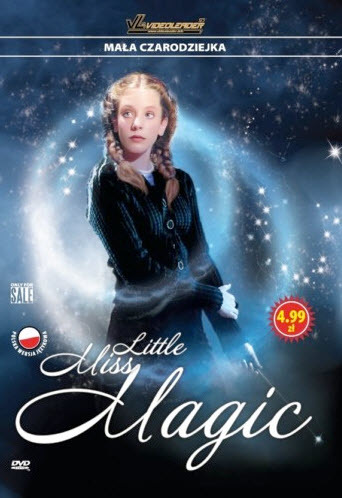 He also told me he's most proud of the role he played in getting Vanessa her only starring role in a commercially distributed feature film to date, Fred Olen Ray's Kidwitch AKA Little Miss Magic. She was 13. After the split with her manager Brad, Vanessa Koman's screen acting career -- as far as you could tell by checking IMDb -- appeared to have fallen into a black hole. Then, a few days ago, I stumbled across a 2010 three-part web series, The Yoga Studio, not only starring Vanessa Koman, but written, produced and directed by her. Web series come close to being zero-budget-based film-making, produced with consumer-quality video cameras, edited on personal computers with basic-level video editing software, and relying entirely on the ability of a filmmaker to con their friends into working on the project. Often enough even actors with professional credits will participate, because paying gigs are few and far between ... and because these productions fill gaps in an actor's resume. Nonetheless, some of them can be quite good, and on occasion they've even opened doors to studio interest for professional productions with real budgets. What jumped out at me while watching the three webisodes of The Yoga Studio was Vanessa Koman's sharp learning curve as both an actress and filmmaker -- starting out weak and amateurish in the first episode and achieving professional production values by episode three. In Episode 1, "The Homeless Guy" (5:32), Vanessa plays Caitlyn, the receptionist at Yoga Dream who, while trying to eat her lunch, is repeatedly interrupted both by phone calls (one a prospective student, Miss Laura, one from someone who's phoning in an order for frozen yogurt, and one from her boss, Rachel), and by Bobby, an off-center and chaotic homeless man (Leandro Cano), involving a mysterious box of granola bars and a beverage straw used as a makeshift flute. The episode doesn't work for me. The static camera set-up for the first part is lame, and Vanessa eating while delivering dialogue is major distracting and off-putting. Word of advice to actors and directors: don't do that. Leandro Cano mumbles. This isn't a problem for a lot of directors today, which is why I watch TV and newer movies with captions turned on. When I direct I break with this modern trend and actually demand minimal levels of audibility and diction before I move on. Episode 2, "The Nerd" (4:13), starts with a tepid conversation between Caitlyn and Miss Laura (Allison Horack), focusing on Miss Laura's signing up for classes, a Prometheus-award-winning science-fiction novel Caitlyn has recommended to Miss Laura, and Caitlyn's travel plans to New Zealand. This conversation is mercifully interrupted by the entrance of a nerdy new student (Robert Downs), recommended to the studio by his mother, who tries to hit on Catlyn then launches into a sword-and-sorcery set piece to protect her from imagined attackers. This episode begins to work better due to more fluid camera movement and editing. Vanessa's comic writing and timing also improves immensely from episode one, and Downs' nerdy set piece plays. Episode 3, "The Bus Talk" (4:16), begins with Caitlyn snoozing on the job and being awakened by a visit from her boss, Rachel, (Tiffany Chandon), who gives her a corporate-style pep talk with an extended and faintly racist metaphor about moving from the back of the bus to the front of the bus. The episode ends with an amusing visit from Robert -- and not only is his comic timing better, so is his diction. Good comic writing and acting, better directing, camera work and editing, brings "The Bus Talk" up to the level of some of the better web series I've seen on YouTube. Vanessa's comic timing shines. A pay off joke with Robert, at the end of the credits, ends the series nicely. I'm happy to see Vanessa Koman working again, and developing new skill sets. Maybe the next time I offer her a "roll" in my next picture she'll even be available.